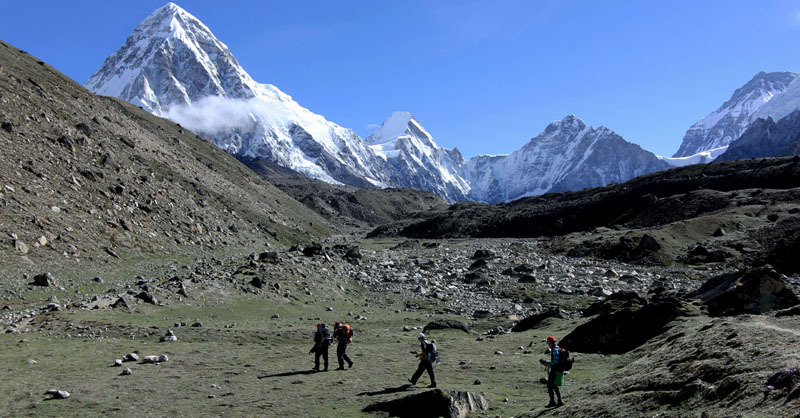 Involves trekking up to 6 hours a day upt 5400 meters for the duration of 9 -18 days . Any reasonably active person should be able to manage these trips. Beginning from Lukla, we will walk through all the Sherpa villages on our way to the Everest and back. 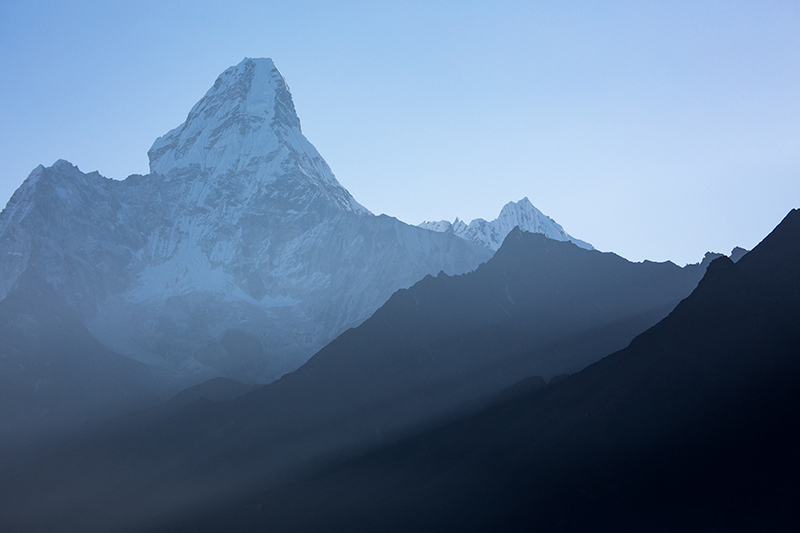 Stand on the foot of Mount Everest and gaze at the majestic giant all you can. 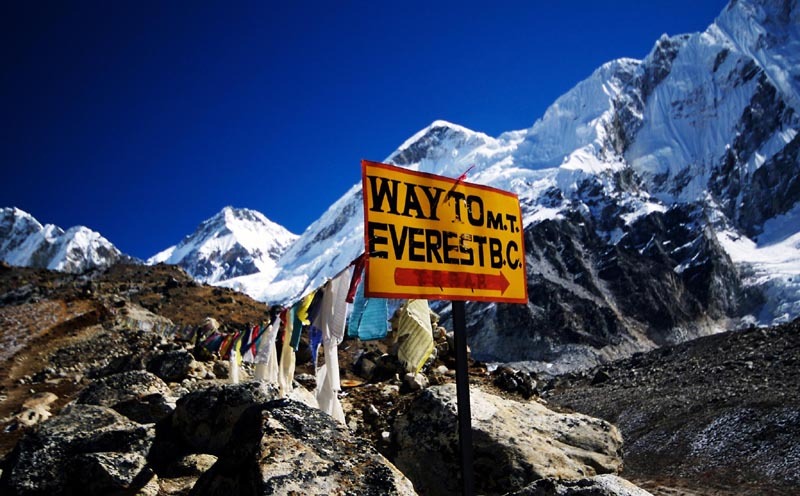 The Everest Base Camp is where all mountaineers begin their summit of the highest peak in the world. But wait, the journey begins quite before that. You have to walk through gorges, valleys, rivers, forests and villages to reach the base camp itself. And that is what we will do. 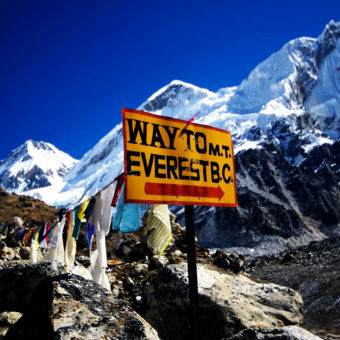 Although we will not attempt to scale the Everest, we will set foot on it nevertheless. It is not the same but it comes quite close. One of us will be there to pick you up as you land into Tribhuvan International Airport in Kathmandu (4,600 feet). Your journey starts the next day and we will brief you on your big trip. 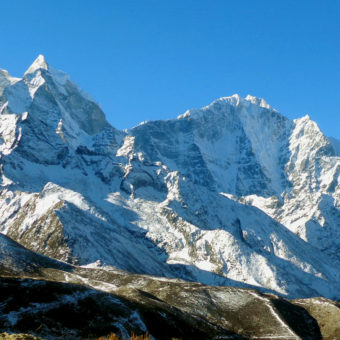 Fly to Lukla (9,334ft) & trek to Phakding (8,562ft). 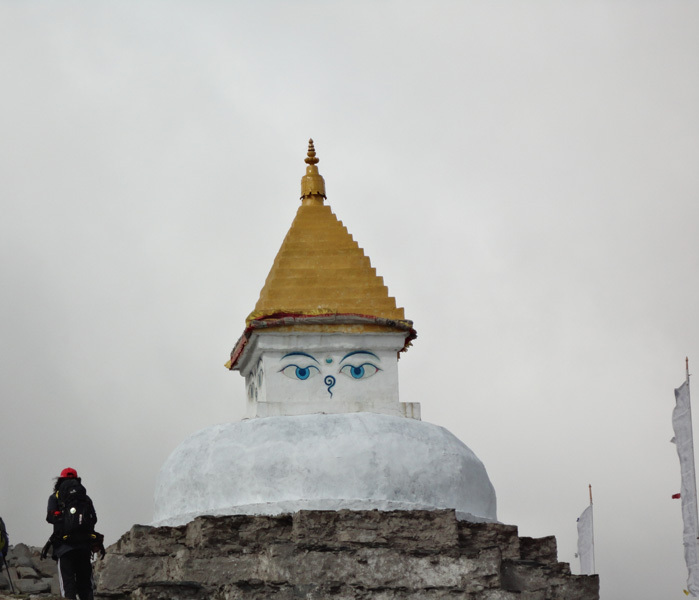 A half-an-hour flight takes you to Lukla, a small tourist town overlooking Everest. 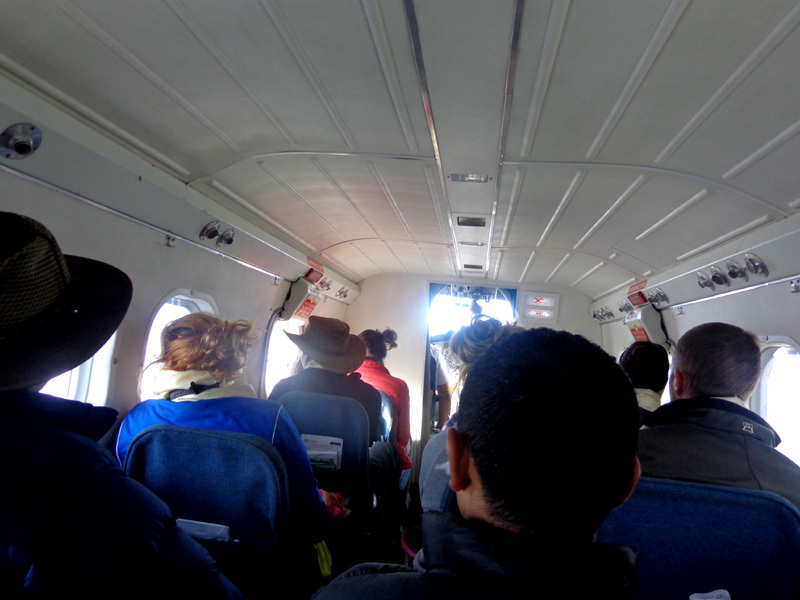 Landing into the Tenzing-Hillary Airport puts you officially inside the Everest Region from where you will begin your Everest Base Camp trek. We will start with a three-hour warm up trip downhill to Phakding village and rest for the day. Trek to Namche Bazaar (11,290ft). 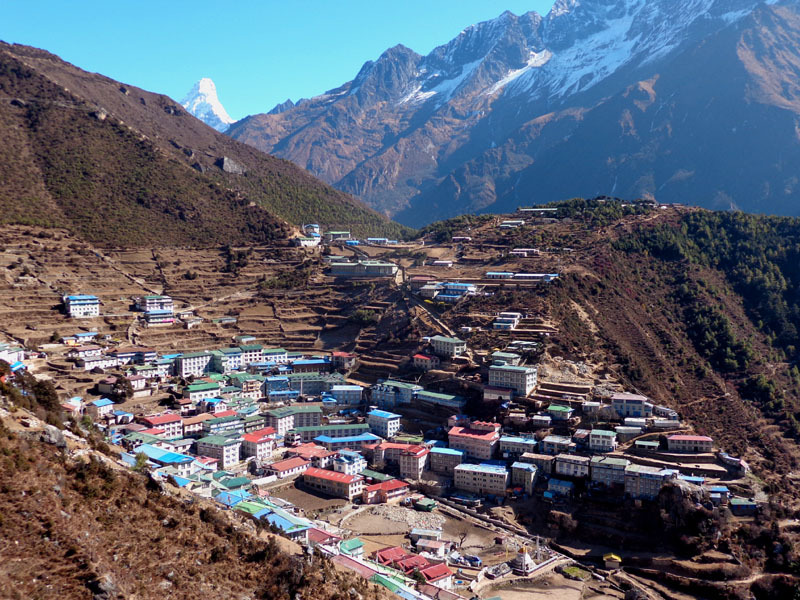 Not more than three hours of hiking and gaining 2,000 feet in altitude will get you to Namche Bazaar, a Sherpa town with probably more tourists than Sherpas. 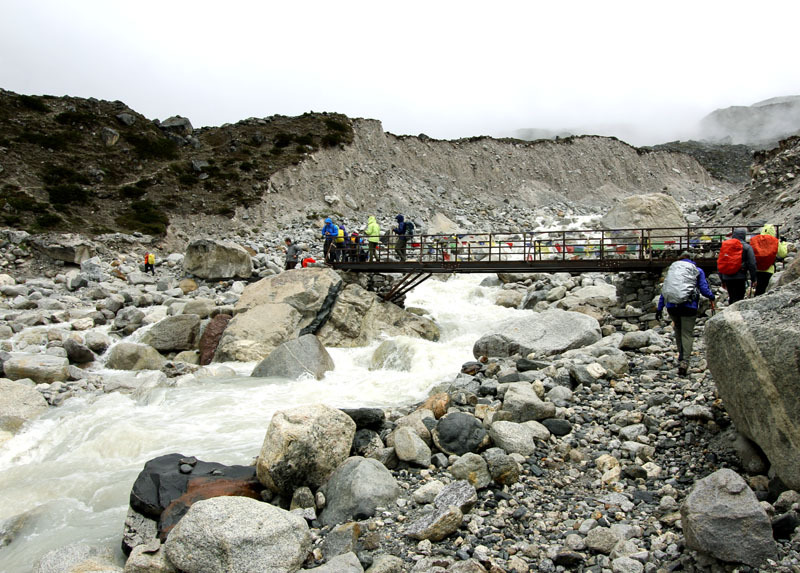 You will be entering into the Sagarmatha National Park and walking through suspension bridges over vertigo-inducing gorges to get there. You will find just about everything at Namche Bazaar so you might want to go for a last minute shopping or perhaps chill out at night club. While acclimatising to the freezing temperature and an elevation of 11,290 feet at Namche, you will get to meet travellers like yourself who are heading to or returning from Everest. This is an altitude acclimatization rest day. You can visit the market and meet with local Sherpa people and fellow travellers. Rest well as your trek starts getting tougher from the next day. Located at the confluence of the Imja River and the Dudh Koshi River, Tengboche is home to the largest monastery in the region the Tengboche monastery. It takes roughly five hours of trekking to get here from Namche. 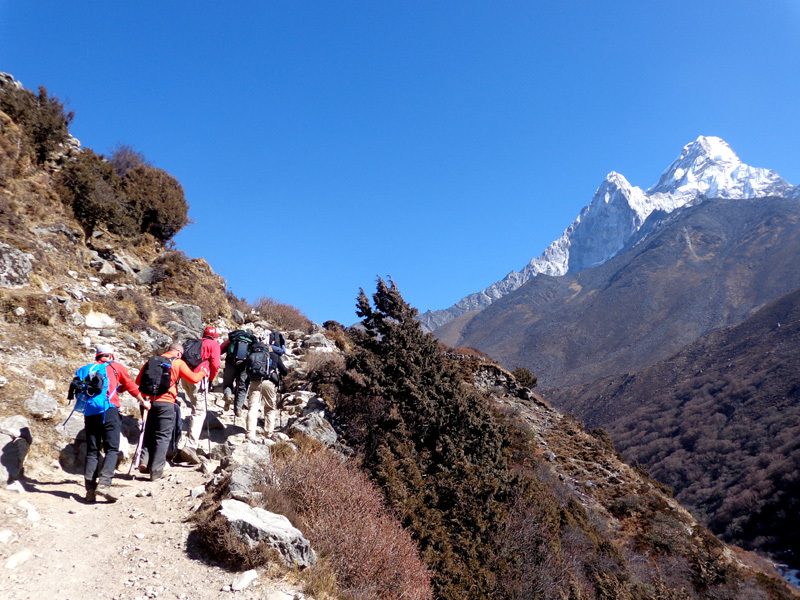 Six hours of tough hiking takes us to Dingboche. This hill station is cold and arid and you might feel the first real signs of fatigue in your journey. You will rest here for two days as this is a perfect place to get acclimatized to the rising altitude. Dingboche is good for a day of sightseeing. It is located at the bank of the Imja River and the monasteries and the stone walls here are prime tourist attractions. You will again have to climb close to 2,000 feet the next day so rest well. 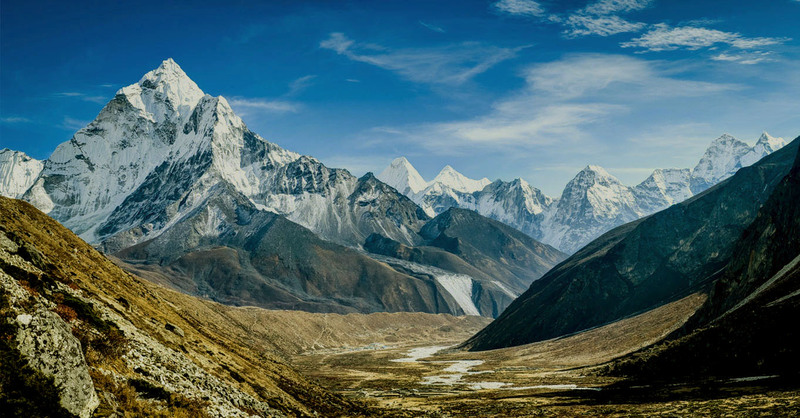 On the 8th day of your expedition to Everest Base Camp, you will hike through rugged snow-covered terrain passing through Thukla village to reach Lobuche at the foot of the Khumbu glacier. By now, you will find yourself quite acclimatized to the Himalayas and your much-awaited trip to Mount Everest will just be a day away. Trek to Gorakshep (16,942ft). After lunch trek to Everest Base Camp (17,598ft) & trek back to Gorakshep. A short three-hour trek will take you to Gorakshep, a village sitting on top of a frozen lake bed. This village will serve us lunch and will be our final stop on our trek to the Everest Base Camp. 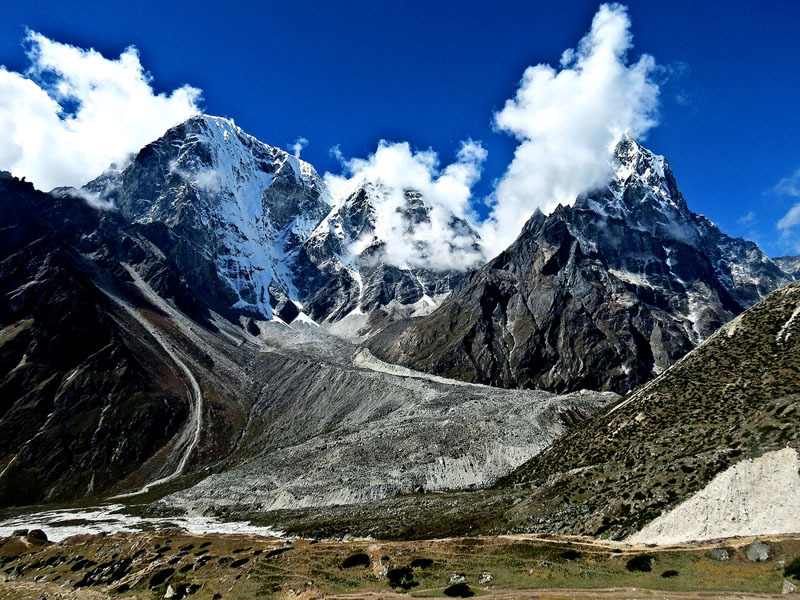 It’s a two to three hours walk to the base camp from here and you will get to stand on the foot of the tallest peak in the world. Gaze at the Everest as much as you want but you cannot camp here with your trekking permit so we will have to return to Gorakshep before night. 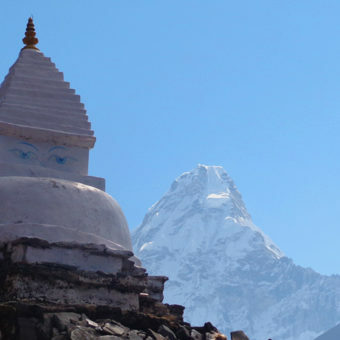 Hike up to Kala Patthar (18,519ft) & trek to Pheriche (14,340ft). 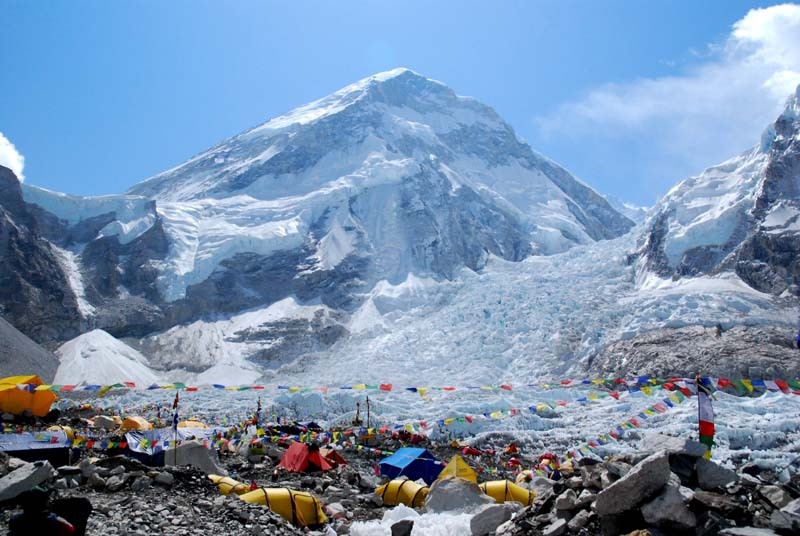 We will ascent to Kala Patthar, which lies on the southern ridge of Mount Pumori (23,494 feet). It’s a two-hour uphill expedition that will put to test your mountain-climbing skills. 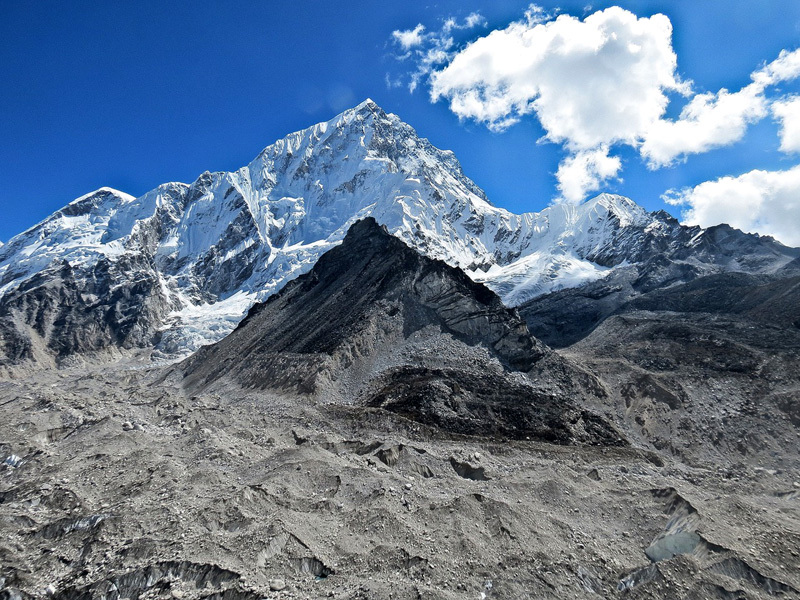 Here you will get the best panoramic view of the Everest along with the Khumbu Glacier and other Himalayan peaks. It’s all downhill from here and we will descend to Pheriche, a small village full of yaks, and rest for the day. An easy downhill trek through forests, suspension bridges and alongside mountain ridges will get you to Namche Bazaar. Upon reaching here in about six hours, you will feel like you are back to the society after your ordeal with wilderness. It’s a great place to share your experience with fellow trekkers and look back on the feat you just achieved. 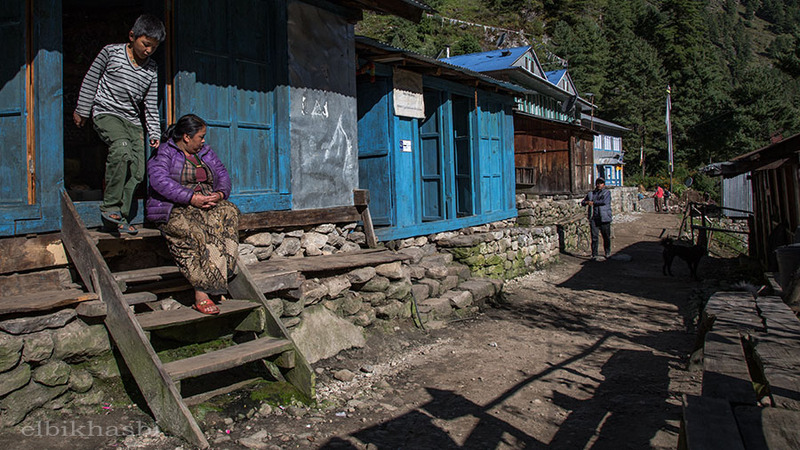 It will be a five-hour trek down to Lukla, the place where it all started. 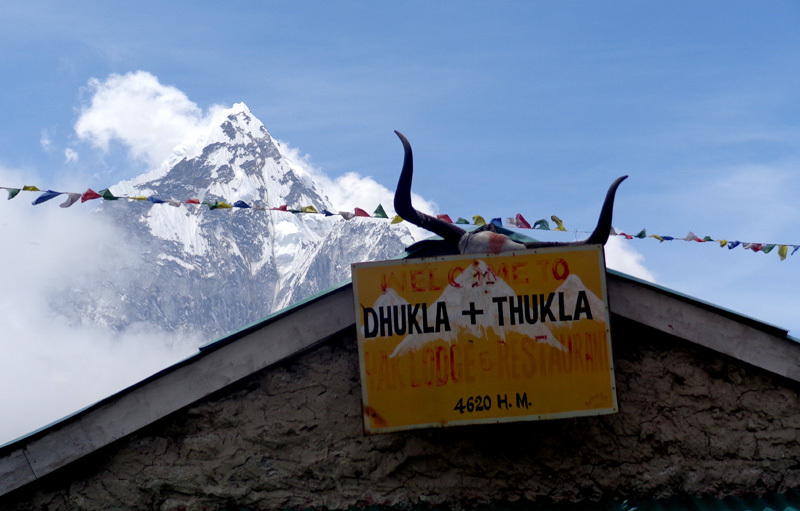 Your Everest Base Camp trek ends here and Lukla is famous for hosting your end-of-journey party. You will not have to walk anymore. After a half hour flight to Kathmandu, the noise of the city will remind you of the tranquility of the Himalayas. Sightseeing around Kathmandu. Farewell dinner. We will take you around famous landmarks of Kathmandu in a tourist vehicle. Visit royal courtyards, monasteries and temples which have been included in Unesco World Heritage List for their cultural, historical and religious significance. Although damaged by the devastating earthquake of 2015, they still offer a glimpse into local culture. Before you leave, we have a farewell dinner to officially end your vacation. It is your last night in Nepal. We will drop you to Tribhuvan International Airport and you will be gone with recollections of your Himalayan journey to keep you busy throughout the flight. Receive you from and drop you to the airport or hotel in our company vehicle. Stay at a three-star hotel in Kathmandu on a twin-sharing basis. Breakfast is on us. Sightseeing around Kathmandu in a private vehicle with our guide. All entrance fees will be paid. Stay at guesthouses during the trek on a twin-sharing basis. Breakfasts, lunches and dinners will also be taken care of. 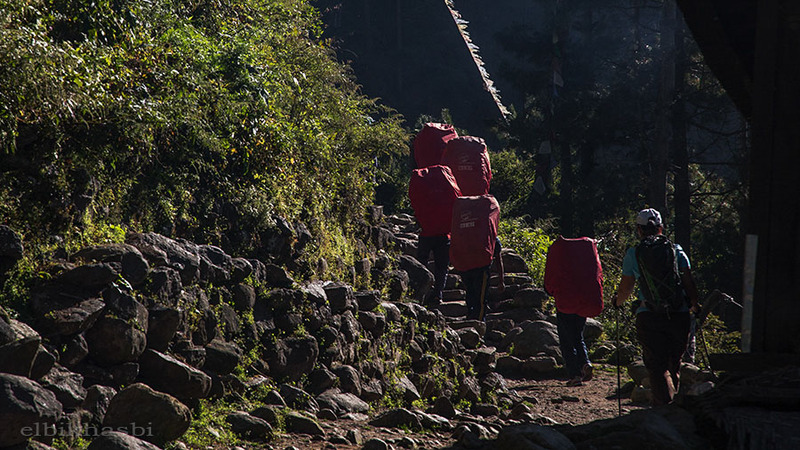 Porters (one each for a pair of travellers) and local support staff to help you trek. We will lend you a down jacket and a sleeping bag for throughout the trek. Fully paid round-trip tickets for Kathmandu-Lukla flight and back. Rides in private vehicles included in the itinerary. A duffel bag, a sun hat and a t-shirt as a souvenir from us. A traditional Nepali feast with cultural shows as a farewell dinner. All tourist fees, government charges and other official expenses throughout the trip. Additional stay before, during or after the set itinerary. Charges at airports or other areas for excess luggage. Alcohol, hot or cold drinks, bottled water, and other snacks. Phone calls, internet, laundry, additional porters, and other personal expenses. Visa fees for entering Nepal. Other expenses not mentioned in “Included in cost” list. In Kathmandu, you will stay in a three-star hotel while you will be staying at standard guesthouses during your travel. There will be electricity, internet, laundry and hot showers in all of the places you stay. You will have to share your room with a fellow traveller in our typical package. Single supplement will be served on request and will cost an additional USD 275.Also note that single rooms is easily available in Kathmandu and the trekking regions at lower elevation but it might be difficult to find them at higher elevations. How do I come to Nepal? You have to book your own international flight from your country to Nepal and back according to your trip departure dates. What happens after I land into Nepal? A chauffeur from Mountain Kick will come receive you at the airport and take you to your hotel. Representatives of the company will visit you at the hotel itself and brief you on your trip. What will a trekking trip with Mountain Kick involve? You will trek in the Himalayas in a group of international travellers fully assisted by our guides, porters and local support staff. We will take care of your entire trip as soon as you land in Kathmandu and safely take to your preferred destination and back as per the package you choose. Travel will involve plenty of sightseeing and mixing with local culture. In what physical condition do I need to be for the trip? A regular person can complete the trip with help from our guides and porters. But it is important that you are healthy and have no physical injuries. Trekking for long hours in high altitude and difficult terrain will surely put a strain on your body and you might suffer severe physical and mental breakdown, especially if you are trekking in the Himalayas for the first time. It is, therefore, expected that you have taken light endurance training especially for longer trips. How long do I have to trek each day? On most days of your trips, you will trek for a couple of hours only. But some trekking days require as much as six to eight hours of walking in high altitude. However, there will be plenty time each day for rest and acclimatization. Where will I be staying during the trip? In Kathmandu, you will stay in a three-star hotel while you will be staying at standard guesthouses during your travel. There will be electricity, internet, laundry and hot showers in all of the places you stay. You will have to share your room with a fellow traveller in our typical package. At some destinations, especially in the Himalayas, you will have to stay in a tented camp. If you want to make separate living arrangements, talk to us beforehand and we can arrange single rooms for additional $250. Some guesthouses at very high altitudes and remote places may not have attached washrooms or single rooms. All your major meals (breakfast, lunch and dinner) are included in your trekking package except in Kathmandu (where only breakfast is provided for). You will be served local food at all places we dine but you can order anything you like on the menu which you will have to pay for yourself. You will have a range of options so there won’t be a problem if you are a vegetarian or vegan. We make sure you get healthy and hygienic food throughout your travel. How much help do I get during the trek? Our guides and porters always put your safety and comfort first. We have English-speaking guides who take you to all major attractions throughout the travel and are happy to answer all your queries. We have one porter assigned each for two travellers and you will have to pay separately if you want to hire extra porters. We have local support staff in all villages and camps you reach to assist you in any way possible. What happens in case of injuries and emergencies? The guides always carry a professional first aid kit with them to treat with minor injuries. We also have health professionals at villages and camps along the journey. The travel insurance you take (which is compulsory) covers any and all emergency rescue and evacuation. What if I want to do something beyond the itinerary? We are always happy to accommodate your wishes during the travel so far as they do not conflict with schedules and other travellers. If you have special plans, you can talk to us beforehand so that we can arrange a customised trip for you. What equipment do I bring? You have to bring all travel equipment yourself. Please see the equipment list section for a standard list of required equipment prepared by our guides. Most of the items are easily available in Kathmandu in case if you miss any and we also lend you some of the gears for the duration of the trip for a small fee. Will I get to communicate with the outer world? There is internet and telephone connection in all of our stops for the day throughout the journey. You will be able to call back home or post your pictures on Facebook everyday. As soon as you land into Kathmandu, we take care of all your travel documents required during your trip. You just need to bring your passport and a copy of your travel insurance. Tourist fees and permits to enter certain areas will be arranged for by Mountain Kick. Which is best time of the year to travel? Most of the trekking routes are open throughout the year but September through to December and March to May are the best months to travel. What are the modes of transportation for travel mentioned in the itinerary? Rides for sightseeing and reaching destinations within city limits are done in a private vehicle like a car, a jeep or a microbus. Most of the long distance travel is done in luxurious tourist buses hired exclusively by the company. In some journeys, you may also need to take a public bus but as you will travel in a group with our guides and support staff, you need not worry about your safety or comfort. How much money do I need to carry during the trip? Around $50 will be enough to buy you lunch and dinner in Kathmandu. During your travel, you can get by with around $25 a day. But it depends on how much you want to spend. Due to the exchange rate and predominantly rural economy of Nepal, things are pretty cheap in Nepal. Almost all international credit cards are accepted in Nepal. However, not all places, especially during your travel, accept them. There may be a fee involved in processing your card. Are tips for my guides and porters expected? How much? Our staff do not expect you to tip them. Generally, travellers tip them if they are satisfied with the service as a means of gratitude. Even when travellers tip the guides and porters, there is no fixed rate. However, if you like to tip them, follow customs of your own country for tipping (which, as we have learned, is 10 to 15 percent of total cost for most western countries). Where will I get a visa to come to Nepal? You can obtain a visa at your home country through Nepal’s embassy or consular office. But you can easily get a visa upon arrival at Tribhuvan International Airport in Kathmandu. You just need two passport-size photographs. A tourist visa with multiple entry for 30 days costs $40 while the same for 90 days costs $100. Click Book Now to enter your details and we shall contact you. You can contact us directly for any further information or to prepare a customized itinerary for you. For payment information, see our Terms and Conditions. Requires you to climb mountains for most part of the trip but in short sessions and plenty of rest and sightseeing in between. Please make sure you take a travel insurance at home before arriving here. It is mandatory and you cannot take it in Nepal. Your insurance agent will know which insurance plan suits your travel. It is advisable that you free up a few days before and after your trip schedule. For reasons beyond our control like flight delays, accidents and natural hazards, the itinerary may have to be altered. Please note that the flight to Lukla, the first step in your journey, is very vulnerable to weather shocks and it is common that flights are delayed or cancelled due to unfavourable weather. Please inform us and our guides if you have any medical condition that might affect your trip. Please consult your doctor beforehand for any precautions you need to take and always carry medicines if you need them. However, our guides and local support staff have been trained in basic medical intervention and your travel insurance covers any emergency rescue or evacuation. You may decide to alter your itinerary to some degree as long as there are no time constraints and everyone consents, if you are travelling in a group. Talk to us before embarking on the trip or you may also talk to our guides to see if we can arrange something. One thing we have learned from mountaineering all these years is however good you plan your journey, there are bound to be some improvisations to make our experience richer. 2 season sleeping bag – one. Spring down jacket – one. 35-45 liter daypack – one. You can alternatively use balaclava, beanie, or hooded jacket which will be quite sufficient to keep you warm. Glacier glasses with side shields and 100% UV protection as you will face very intense sun rays at higher altitude with high UV radiation level. If you use prescription glasses, you can find glacier glasses with prescription lenses. Synthetic liner gloves – one pair. Winter fleece gloves or wool gloves – one pair. Shell gloves – one pair. Hand warmer (optional). Wearing multiple layers of your gloves should be enough. Lightweight thermal tops – two. For women: synthetic sports bra – two. Nylon hiking shorts – two pairs. Trekking pants – two pairs. Synthetic long underwear – two. Synthetic softshell pant – one pair. Waterproof pant – one pair. Jeans, cotton or khaki pant – one pair. Synthetic liner socks – four pairs. Heavyweight socks – three pairs. Lightweight socks – one pair. Waterproof light trekking boots – one pair. Choose wisely as you will be doing a lot of walking. Sneakers – one pair. (You will not be trekking throughout your vacation). Extra strength Excedrin for headaches. Imodium or Pepto-Bismol for gas, upset stomach or diarrhoea. Ointment for blisters and cuts. First aid kit (optional). Our guides always carry a professional first aid kit with them. Your passport. Passport size photos – four copies. SPF 40 sunscreen for UV protection. A toiletry kit with towels, toilet paper, hand sanitizer, hand wipes, soaps, etc. Trekking poles. These will provide stability, take the stress off your knees and greatly increase your trekking speed. Munchies (all the walking might make you hungry during your trek). Books or mp3 players (a smartphone is great). Hydration bladder. You might also want to carry a thermos. A pee bottle (or a pee funnel for women). Note: The lists have been prepared by our guides based on experience and are meant as suggestion for an average trekker. Each trekker will have his/her own preferences and necessities and we recommend carrying everything that you think you might need. You will find several options for each equipment and we advise to select the best match for your particular trip. You can purchase almost everything on the lists in Kathmandu and we are happy to help you choose. We give you the power to choose the departure date that suits your group best. A private trip is a perfect solution if you can’t find a published departure date that you and your companions agree on. You can set up a private departure for most of the trips we offer. We never force our customers to follow our set itinerary.You can customize your itinerary exactly the way you want. Please share with us your ideas. As one of the core guiding principles for Mountain Kick, we always give back to the mountain community in any way we can as a means of gratitude. The people who live in the Himalayas and share their homes with us deserve to have all their little problems fixed which seem very basic for outsiders but are commonplace in rural Nepal. The people lack proper access to healthcare, sanitation and education but a little effort from travellers goes on a long way to solve these issues. Mountain Kick has made it its corporate social responsibility to help improve the living standards of the local community. We make donations to their cause, organize social campaigns and programs and also have a few trips designed to mix a little volunteer work in your holiday.